Not exactly the user experience I have come to expect from any of the many connected consumer devices I possess. This process wouldn’t be any different if I had taken my car to the garage – they too would have had to follow this same 32 step procedure. Software management including steady updates of features and functionality need to become the norm and not the exception. Our cars need to start behaving the same way as our smartphones – seamlessly updating, without requiring user intervention, to give us new features and improved functionality on an ongoing basis. 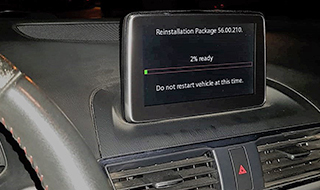 I’m working with a team that are developing a clientless OTA update technology that will enable all and any ECUs in the car to be updated instantly without requiring user intervention and with zero downtime. This technology will enable the car software to seamlessly and constantly improve, making me feel more positive about buying another car from the same brand next time around. Now if you’ll excuse me, I’ve still got 12 more manual steps to do before I complete this update and I need to keep my foot on the brake!